Former Vanity Fair and New Yorker editor Tina Brown appeared on Friday's "Morning Joe" to lament that a new liberal ad featuring Rush Limbaugh would only elevate the status of the "blow-hard bullfrog" conservative host. The liberal group Americans United for Change has a spot running that slams Republicans as a party of no and features a clip of Limbaugh's now famous comment that he wants Obama's liberal policies to fail. 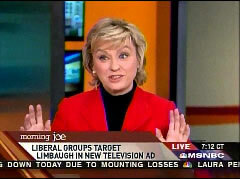 After "Morning Joe" co-host Willie Geist played the ad, Brown asserted of the commercial, "I adore the 'party of no.' I think it is wonderful." She then complained, "The only thing I do regret though is that this giant, you know, blow-hard bullfrog, you know, Rush Limbaugh is being turned into this big icon." Brown, who now edits a website, "The Daily Beast," added, "So, you know, I love 'the party of no,' but I'd love it not to wind up making Rush now into this kind of giant, you know, figure." (Considering the millions of listeners and influence that Limbaugh has, most people would say Rush already is a giant figure.) When questioned about the "blow-hard bullfrog" line by fellow guest Pat Buchanan, Brown reiterated, "He is a bull frog with a bullhorn. What can I say?" Another over-the-top Brown comment occurred on October 9, 2008. The liberal journalist appeared on "Good Morning America" and trashed Senator John McCain and his presidential campaign for being dishonorable. She derided, "Like, what happened to this man who was such, a kind of, honorable, great American? The campaign doesn't seem to live up to his sense of honor in any way. And he's really changing." AD: An economy in crisis. A President determined to act. But, what did Republican leaders say to President Obama's jobs and recovery plan? ANNOUNCER: What did they say to 3.5 million jobs? ANNOUNCER: What did they say to tax cuts for 95 percent of working Americans? ANNOUNCER: What did they say to rebuilding roads, bridges and schools? ANNOUNCER: So, who are Republican leaders listening to? RUSH LIMBAUGH: I want him to fail. ANNOUNCER: Tell them America won't take no for an answer anymore. GEIST: So, the party of no has become the buzz term of the last couple days. BROWN: I adore the "party of no." I think it is wonderful. The only thing I do regret though is that this giant, you know, blow-hard bullfrog, you know, Rush Limbaugh is being turned into this big icon. I mean, this is a great ad for Rush Limbaugh, too. So, you know, I love the party of no but I'd love it not to wind up making Rush now into this kind of giant, you know, figure. GEIST: Be careful, because Mika has got a little bit of a crush on Rush these days. MIKA BRZEZINSKI: I do appreciate irony. And I would just like to clarify about Rush. I just think he has tremendous communication skills. PAT BUCHANAN: Tina- Tina- Pat Buchanan. Can I ask you to elaborate on the phrase "blow-hard bullfrog?" BROWN: He is a bullfrog with a bullhorn. What can I say?